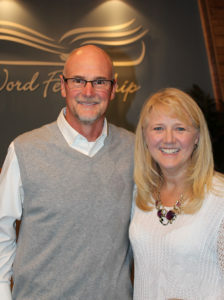 Pastor Troy Bates and his wife Chrisy are 1987 graduates of Rhema Bible College in Tulsa Oklahoma. In 1990 Troy came on staff at Victory Fellowship Church in Nashville, TN and together they served as Youth Ministers for over 8 years. In 2000 Troy and Chrisy moved back to their home state of Minnesota and spent 12 years at River of Life Church in Thief River Falls as Senior Pastor. In 2016 Pastor Troy accepted the call as Senior Pastor at Word Fellowship Church. Our purpose at Word Fellowship Church is to reach people both locally and around the world with the life-giving and life changing message of Jesus Christ. To connect with others in meaningful, Godly relationships. To encourage individuals in their God-given destiny. You can learn more about our purpose as a church at Growth Track: Church 101.